We regret to hear that your experience has not been a great one. We want to help, but unfortunately we cannot locate your account with the information posted here. Please send your account information to customersupport@empire-today.com so that we can follow up with you. We got carpet in 2013 from Empire. Was to be the "highest quality" they have. Within 6 months the carpet began peeling away from the backing. Empire came in and said it was defective and replaced all 1200 sq foot. Within a year it occured again. Their inspector came in and took a "sample" leaving a quarter sized hole that they later refused to replace. The "3rd party" inspector stated it was not a defect and they decided to stretch the carpet where it was peeling away and reglue it only after I contacted BBB. It was okay for about 2 months and then began to do the same thing. 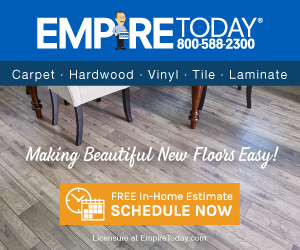 Empire offered me "better quality carpet." For "$400" a room which is hilarous because they assured me I had purchased the best to begin with. I later dropped the issue and am just waiting to save up to buy better flooring for our home. Never would recommend anyone to this company! Their salesmen lie, their customer service is rude, and their warranties have a lot of loop holes. Review #941318 is a subjective opinion of User941318.